Full moon in Pisces September 9th. New moon in Libra September 24th. 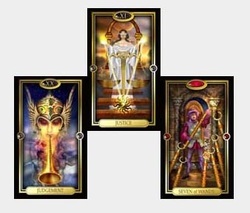 As always, I must remind you that the Tarot are a wonderful guide but they are not your master, only you can decide what is right for you, no one else has the responsibility for your actions or choices. 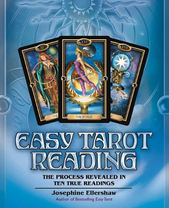 If you’re looking for insight to a personal situation please book a private reading with me. Personal Relationships: Quite a mixed bag for those in the Aries camp this month. If you’ve been hoping to move home or expecting to travel then it may be that there’s a change in your plans. For whatever reason, the Eight of Cups represents abandoning a path and the figure turns away in search of a new direction. It usually suggests that you’ve already expended quite a lot of emotional energy but now make the decision that the initial aim is no longer valid. There can be an air of disappointment with this card, although if you’ve already put a good deal of effort into something this alone can explain why, no one likes to feel their efforts are not heading where they wanted to go. For good or bad, the decision to finally move on will be your own and it’s time to draw a line in the sand. Take time to consider your options this month and those areas where you seem to be giving a good deal yet not receiving the type of progress or fulfilment you hoped for. New directions will hold more promise so don’t be afraid to let go of those things that no longer serve you, or were not all you thought they were cracked up to be initially. Career & Business: So far as work and career are concerned, finances are looking good and the opportunity exists to make great gains in this area of life at the moment! 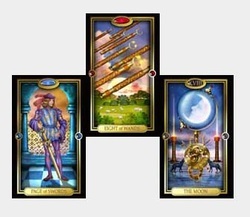 The Knight of Wands is a good card if you’re involved in property through work but I’ve found it has also shown when people have physically changed their office location, not so much position but where you actually do your regular work. If you’re self-employed or have your own business then a change of premises (or renovations) could improve money matters quite substantially. 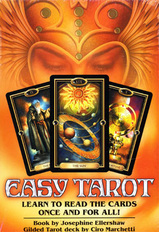 As a card of travel and movement these types of industry and career would also be relevant. Generally, the Nine of Pentacles is a card of financial comfort, so moneymaking opportunities will exist, or perhaps a satisfying work review will find you rewarded. Personal Relationships: The Ace of Swords is a powerful card that shows triumph over adversity, so no matter what situation you may face you have the ability to come up trumps. The Hierophant as the key card tends to show that the pathway to your success is achieved through taking a conventional approach, as it’s not known for rocking the boat or stepping outside the lines. True, this may not sound the most inspiring or fascinating approach but sometimes the tried and tested is the best bet. The traditional family unit can sometimes be represented by this card as it favours strong traditional principles, so there could be significant progress on that front this month. If you’re single and dating then old-fashioned values or methods of meeting are significant and could lead to an interesting new liaison. Married couples and committed relationships benefit from clarity and the ability to maintain a united front in the face of any challenges life could throw at you. The Ace of Swords brings victory if you pull together your reserves of strength and mental clarity – it makes you an unstoppable force! Career & Business: Higher authorities may not be your flavour of the month in the workplace and it could bring additional work in your direction or make you feel somewhat bogged down. Large organisations can be mired in red tape and within itself this can leave you feeling powerless in the face of rules and regulations or the set ways in which everything has to operate. If you’re trying to instigate any kind of change it’s probably best not to push forward with that particular plan at the moment, unless you want to be left exasperated by cries of “that’s the way it’s always done.” You can avoid becoming exhausted by quietly towing the line this month. Secret plans could be afoot, possibly your own and something you’re certainly keeping to yourself for the moment. Personal Relationships: Love and personal relationships appear to be positively blossoming in the Gemini camp and The Magician encourages you to step forward with confidence. The Two of Cups indicates a relationship deepening and moving to the next level. Those who are married or attached have an unshakeable bond this month that finds a united front. If you’re happy in love the rest of the world won’t get a look in. For those single but wishing to date, romance can develop with someone to whom you’re already close and feel a strong connection with, a friendship could become something so much more. Have confidence in yourself and with all your personal relationships this month, as you should find an easy rapport with family, friends, and lovers. Career & Business: Be careful with finances this month, and if you’re in business or self-employed try to conserve whatever funds you have for the moment in case an unexpected bill arrives. This isn’t the time to invest or become involved in speculative ventures, you can always look into things later. With this combination I’d also be wary of a silver-tongued sales person or a smooth talker who could turn out to a con merchant. Read the small print on contracts to ensure you understand the finer details; check your change, and double check invoices, statements and accounts, etc. This month should find you risk-averse and being canny with the pennies. If you’re looking to start something new, expand, or change position, you may find the finances are not as you hoped. 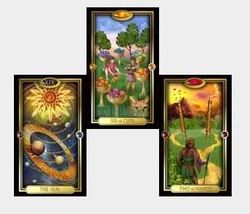 Generally, it would be best to sit tight under these influences and do due diligence, as the Five of Pentacles could otherwise punch a hole in your pocket. Personal Relationships: Overall, work and money matters seem to dominate the theme this month across the board. The Three of Pentacles indicates work that you’re good at and enjoy, with others recognising your talents and abilities and you should see some financial reward for previous efforts. 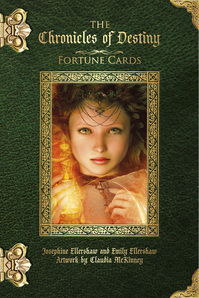 The Seven of Pentacles indicates gathering in your harvest from hard work that has gone before. Whilst we could read this on a metaphorical level (connected to relationships) combined with the Three we find the strong work influence, so work matters will impact on your personal life this month. These are good influences if you’re trying to negotiate anything of a financial nature or sow your seeds for future endeavours that will reap benefits later. Career & Business: What’s interesting is that whilst we have a positive impact on the personal level, in the actual area of work the Nine of Swords represents worries and anxiety. 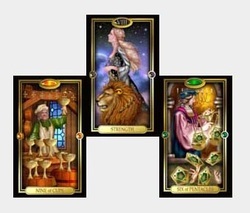 It could be that you’re worrying you’re not good enough, which is counterproductive and contradictory to the message of the Three of Pentacles. With these indications, it may be that you’re being too hard on yourself or worrying unnecessarily. If you look at the swords in the image you’ll notice that they don’t physically touch the person, yet they bar the window as they sit upright in bed, worrying and unable to sleep. Fears may be unfounded but can provide a convincing argument if you allow them to get the upper hand, in turn they can create mental suffering. At the moment it’s important to recognise the good in what you do and your own talents within it, rather than what you seem to see as personal failings. Try to focus on the positive this month in order to eradicate negative emotions, as things are not as bad as they may seem. The Queen of Swords represents a woman with backbone, someone who is prepared to speak the truth and unafraid to speak up for themselves or others if they see a situation that appears unjust, as they always like to see fair play. She has an agile mind, constantly processing information, and can appear slightly aloof or preoccupied because of it. A female solicitor or woman in uniform may be relevant. Whoever this woman may be, whether as yet known or unknown, she will have a strong influence over events in your life this month. Personal Relationships: You may be in two minds over personal issues this month and this within itself can create a stalemate situation. Try to avoid anything that leads to loggerheads with those closest to you because someone will need to step aside in order to avoid a deadlock developing. In the eyes of the Universe no decision is a decision, so be careful of sitting on the fence for too long if resolutions are required. 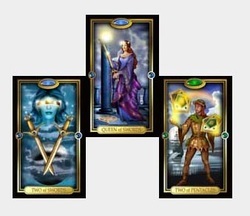 Your Queen of Swords would make a welcome ally in this regard, for insightful clarity and a balanced overview, to help you make some necessary decisions. Career & Business: Two twos add to the influence of unity and a spirit of cooperation this month. The Two of Pentacles could find you considering cash flow matters, so if there’s a been a lack thereof you should be pleased to see this card, as it represents confidently maintaining a balance. You may be required to consider the balance of your time, the famous work-life balance we strive to find and maintain. Alternatively, this card often shows when people are balancing more than one job or project. You’ll cope admirably this month, multi-tasking will flow easily and efficiently so have confidence in your ability to keep everything moving in the right direction. Personal Relationships: As a pair, the Eight of Swords speaks of feeling trapped by something that has gone on for some time but as a progression, you can finally move beyond the limitations. Whilst the atmosphere and energy of the Eight of Swords may still be experienced the Knight of Pentacles shows how you can overcome those restrictions. Whilst the fears held within the Eight of Swords are all that bind you to it, it can still be difficult to acknowledge this sufficiently to the self in order to find release. However, the Knight of Pentacles shows that you now have a real opportunity to dismiss the mental monsters once and for all – how liberating! Something that’s gone on for quite some time is finally forthcoming at last but it’s due to taking a methodical, patient, and practical approach… slow and steady wins the race. In all your personal relationships this month, take the longer view, and banish the demons to history, where they belong. Career & Business: Patience appears to be a recurring theme across the board this month, with Temperance following suit in career matters. You could find yourself in the role of peacemaker by proxy, regardless of whether you volunteered, to restore peace and harmony amongst the ranks. 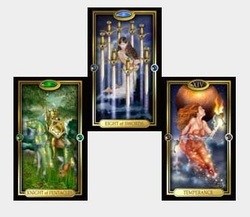 The gentle nature of Temperance indicates moderation in all things, the ability to find compromise that leads to solutions, particularly with the Eight of Swords niggling in your thoughts. The Knight of Pentacles and Temperance reinforce one another and provide the key elements to help you move beyond those things that have hindered you in the past. As a Virgo the traits of these two cards resonate easily for you – there’s so much you can accomplish this month and it should feel very satisfying. Personal Relationships: At first glance the Eight of Wands to the Page of Swords appears to be a contradiction in terms. The Eight of Wands speaks of good news arriving swiftly, whilst the Page of Swords indicates news delayed or of a disappointing nature! The overlap of news makes it relevant, although the combination tends to suggest slightly disappointing news that arrives with some speed. However, if you’re planning to travel there could be delays. The Page of Swords can also indicate children, so there may be some issues to resolve regarding a younger member of the family, although it should be fairly minor in nature, so not serious but something that may need careful handling. Try to avoid becoming involved in gossip or trivial troublemakers this month, it’s not worth your time or inclination. With the Eight of Wands you may feel as though you’re spinning your wheels but not getting very far, or making the progress as fast as you wish… just consider that in the natural order there’s reason for all things. Career & Business: The sun will be moving through your twelfth house before entering Libra as you head toward your birthday, so there’s often a dormant feeling in the run up to the annual return – but all for the good. The Moon is the perfect reflection for things happening under the surface, still developing in the background and behind the scenes. It may make you feel as though you’re on shifting sands and uncertain of which direction to take, but it’s really not the best time for major decisions, so avoid the ‘big ones’ wherever possible. As much as you’d like to move things forward it’s best to wait for the moment, as things will become clearer in due course when you’ll be better placed to deal with facts, rather than illusionary glimpses. These opposing forces could make you feel restless but to counterbalance the effects of these cards against the Eight of Wands you could channel your energy into tying up loose ends, reflect upon your previous year and set new goals accordingly. Once facts begin to surface you’ll be better placed to implement new plans. The new moon entering your sign on the 24th will help to get things nicely rolling! 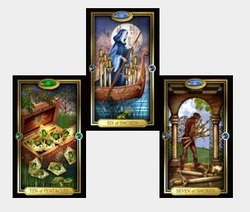 Personal Relationships: There could be sighs of relief on the home front as the Six of Swords moves you away from stressful times and into calmer waters. 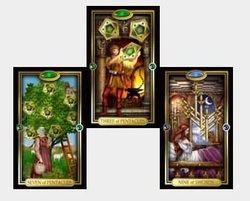 Last month property matters were highlighted with the Knight of Wands and with the Ten of Pentacles it’s highly likely these will now be consolidated, for some this could involve the family home. Home and family are in the spotlight but with a general sense of stability now entering the equation, finances should show improvement with the opportunity to put everything on a firmer footing. There could be a gathering of the clan involving family of various generations. Overall it’s a good month for all personal relationships with some moving towards a settled environment, nesting, and putting down roots together. Career & Business: Someone or something may need careful handling, so it could feel as though you’re taking the kid gloves approach, or having to tiptoe around someone. However, it appears it will be a necessity to get to where you want to be; in this case diplomacy wins the day, taking a strong-arm approach is definitely not the way forward and would probably prove counterproductive. Coupled with the Six of Swords there’s no reason why some sweet-talking and careful navigation shouldn’t help pull off the desired result. Personal Relationships: These are excellent cards for reconnecting with old friends… or old flames. The Six of Cups brings people from the past back into your orbit and, with The Sun, there’s every possibility things could take off and leave you feeling happy with the way things progress. If you’re single, place your focus on past contacts. For those more settled there’s plenty of good cheer on the home front and with your partner in crime. Since the Six of Cups is the key theme for the month then the source of happiness stems from the past. This auspicious alignment should find you smiling… it doesn’t get much better than The Sun and there’s rarely a corner where you won’t find the positive vibes shining through! Make the most of these fabulous aspects as they provide lots of potential for success and happiness on all levels. Career & Business: The Two of Wands could find you working in collaboration with others, and for some there may even be a partnership in the mix, so if this has previously been a consideration then now’s the time to step it up a notch. Initial progress should start to become evident in any new ventures you’ve been beavering away at, which should lift your spirits somewhat. It’s nice to see progress but it’s early days and still much to focus upon and get done in the grander scheme of things, although this should help to spur you on. If you’re looking for new work or new customers, focus on existing and previous contacts, old colleagues, previous employers etc., for maximum benefits. 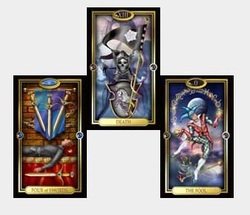 Personal Relationships: Given the two card combination in the work area my feelings is that it dominates events this month and becomes the main focus. So far as your personal area goes it’s time to put your feet up, relax, unwind, and regenerate. You may feel the need to withdraw from the daily grind, re-gather your thoughts and plans, as you consolidate experience and resources, knowing that soon you’ll be back in the driving seat. If you’ve been overdoing it lately then this card is the perfect antidote for some much needed rest. The Four of Swords is a time-out card, a period of rest and recovery from previous stress and strain. With major change on the horizon you could be getting your ducks in a row in readiness for the new plans you’re contemplating. Career & Business: Speaking of new plans, this is where they originate. Death and The Fool follow each other as easily as night and day, off with the old and on with the new, as one cycle ends another begins. It appears you’re firmly closing the door on something and heading in a completely new direction. The Fool takes you into unchartered territory, somewhere unfamiliar, completely unknown and new to you. It may feel slightly risky but also sparks your sense of adventure. If you’re in business you may decide to set off in a completely different direction; Death brings closure and definite ending so it doesn’t suggest a new slant on an old variation or the introduction of a new line, but a completely new start. Perhaps you feel you’ve taken what you do as far as you can and so feel ready to conquer something else, the market may not hold the potential for growth you first thought, or maybe you’re just ready for complete change. These are bold moves and others may think you’ve lost the plot, but The Fool follows his heart and has more foresight than we probably give him credit for. Anything connected to children or play would be relevant, or something unconventional. Whatever you do, if you’ve been waiting for the opportunity to make a major change, this is it! Personal Relationships: You appear to be in a quietly determined mode this month but you seem to know exactly what you want and where you’re heading. Strength heads up the trio as your key theme and you’re pulling on all reserves of inner strength and courage. The Nine of Cups indicates wishes fulfilled so personal relationships hold good promise in general, perhaps little wonder you’re gently determined in your manner. All things considered it’s the right approach and holds you in good stead. If this all sounds a little out of your territory or far removed from how things seem at the moment, take heart, Strength is simply showing you the way to achieve your dreams. Whilst internally they’re resolute they still come softly spoken, gentle words and actions will serve you well. Have the courage of your conviction and just keep going… you’re heading in the right direction! Career & Business: Good news all around for September, as finances show improvement too. Patience and diplomacy will work in your favour with colleagues and associates. Take the long view in projects, with the strength to endure and courage to persist, you should find someone holds you in their good books and may reward you for your efforts, hopefully the boss. The Six of Pentacles indicates gifts and sharing, someone being kind and generous to you and, most particularly, financial gifts. Personal Relationships: It’s difficult to look at these two cards and not wonder if they’re being literal, sometimes they are and it’s one of those areas that can catch you out in a reading (wood and trees, comes to mind)! So, with that said, if you’ve been dealing with a legal matter then a judgment should now be reached. The law or legal contracts may be relevant in relation to the home, and Judgement suggests these have roots in the past. Since they’re connected to the home area buying and selling property could feature for some, most particularly if it’s connected to somewhere you have previous connections to, or perhaps it’s been a long drawn out affair, so you’ll be happy to finally conclude matters. This card is one of the strongest indicators for reconciliation, so the renewal or resurrection of a relationship is possible under these influences, although you will be giving the matter cool consideration with balanced thought. Career & Business: You may feel the necessity to battle your corner in the workplace, or perhaps it’s time to stand up and be counted. Personal principles may come to the fore or you feel the need to stand your ground. This doesn’t mean you have to come out fighting (literally) just prepared to defend those things that are important to you. If you can do so calmly and with good grace then you have the ability to win through. In business, be sure to check the small print in legal documents and contracts, you won’t be in such a strong position once you’ve signed on the dotted line, so ensure you agree with what’s on the table. With Justice as your key theme for the month you may need to be practical and logical with whatever comes up; take a rational approach and don’t be afraid to think things through, Justice loves a balanced mind!